High school exchange program coordinators talk about the needs of students and the needs of host families. Add in the needs, resources, and limitations of the schools we work with and you have a three-legged stool supporting a successful exchange year. But the truth is it’s a four-legged stool. Parents back home can be a key factor, particularly in today’s world of instant communications, even if those parents are often unseen and unheard; it’s just a function of how exchange programs operate that we may have little or no contact with the shadowy figures who send us these teenagers year after year. It’s not just coordinators, either; host parents may or may not have communication with their student’s parents. If they do communicate, it may be rife with cultural and language misunderstandings, and host parents often feel that their student’s parents do not fully understand what is involved in the cultural exchange experience or the study abroad process. Finally, the high schools where our students go to school for a semester or academic year rarely have contact with the exchange students’ parents. Yet, solid parent preparation and understanding of the nature of an exchange and study abroad generally are key to a student’s ability to adapt and develop a healthy relationship with his or her host family and community. Certainly, there are resources about study abroad that can be useful to students’ parents; a recent example that comes to mind is Helene Rybol’s Culture Shock: A Practical Guide (you can read my review of Rybol’s book here). What we don’t see are books or articles specifically exploring the parental side of the equation. Individual exchange programs and university study abroad programs do provide parent orientations, and they work hard to educate parents. Nevertheless — human nature being what it is the world over — parents may not be able to fully assimilate all the information provided to them. Having an outside source can be invaluable. Stacie Nevadomski Berdan, Allan Goodman, and William Gertz are trying to be that source. 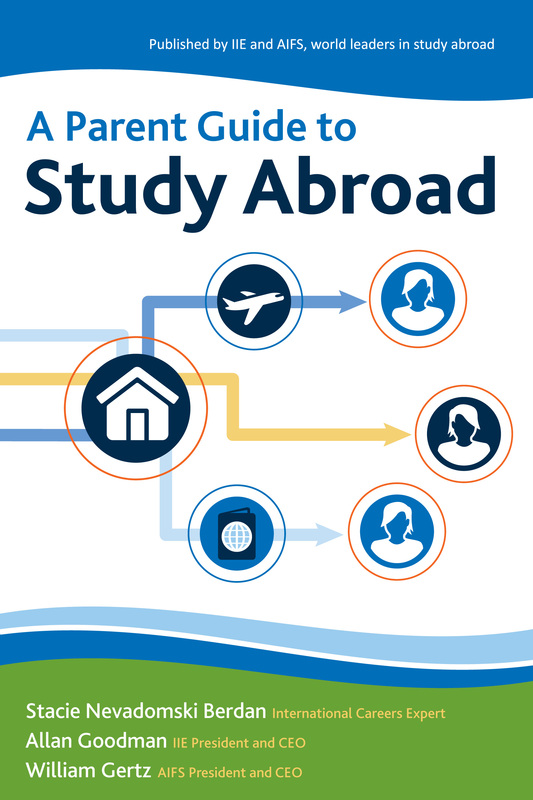 They aim to make parent preparation more transparent in their 2015 publication of A Parent Guide to Study Abroad. Published by the Institute of International Education (IIE), the book’s goal is (as stated by IIE) to “arm parents with the right mix of practical information to get involved just enough, while also giving the students the independence to learn and grow on their own.” The three authors, all well-known and experienced international education and study abroad professionals, acknowledge that parent involvement is critical for a student’s success. But as Berdan notes in her introduction, not every parent knows where to begin; and as Goodman notes in his introduction, parents need a plan. So what is that plan, and what do the authors feel parents need to know to be effective? In truth, it’s not a lot different from what students and host families need to know, which shouldn’t really be a surprise. If you were to only look at the chapter titles, you might think it is almost the same advice as that given to students. Chapters in the book include the value of studying abroad; how to find the best program; addressing costs and means of paying for a study abroad program; staying safe and healthy; and how to prepare for success while in another country. There are some nuances, however, that are different simply because a parent’s perspective is different from that of a student or that of a host family. For one thing, two chapters specifically address parents’ actions during and after a study abroad program. These are key areas in which parents’ knowledge and expectations can help make or break a student’s successful integration into a host community as well as transitioning back home after three, six, or nine months abroad. When my daughter went abroad during her junior year, I was excited for her. I wanted her to have “my” experience” (first mistake). But life is different nowadays, and you can’t really unplug. While she was studying in Florence, we spent far too much time talking on Skype and communicating via Facebook. We were always connected; and while this was comforting for us both, it may have hampered the freedom she needed—the freedom of spirit, exploration, and trial and error that I had. Still, she came home a more confident, more accomplished young woman. Her study abroad program was superbly organized down to every detail, perfect for the millennial generation, complete with ample hand holding. Days packed with detailed itineraries including learning excursions; volunteering trips and language courses were quite the contrast to my backpacking, hostel-hopping days of self discovery. Traveling by air on weekends, she probably had fewer adventures than I had traveling by rail. But I had to remember, this was her experience, not mine. My strong advice is this: let your children breathe. Don’t call too much, don’t solve all their problems, let them make their own mistakes and find their own path. I could go on — there is actually quite a bit in this short 60-page book — but this, in a way, is the nutshell of the book’s messages to parents: help your child choose the program that is right for her, not for you; don’t overuse technology to remind them of what they are missing back home while they are trying to learn a whole new world; and let them learn what it is they went abroad to learn. The book is intended for college students’ parents; moreover, it’s written for U.S. parents. But the issues faced by parents of high school students studying abroad aren’t much different, and the themes of what a parent needs to know and think about apply equally to parents whose students are coming to the U.S. It’s important to have parental support and understanding. It’s important to think about finances; if it’s a good idea for college-age students to understand budgets and how to get access to funds in another country, it’s doubly more so for teenagers who have thought even less than their college counterparts about what ordinary things in life cost. It’s important to think about how you will stay in touch, and how often. It’s important at all ages to “develop a global mindset so that they will be best positioned for success in our competitive, global marketplace” – “one of the best gifts we can give our children,” Berdan notes. There is nothing revolutionary in A Parent Guide to Study Abroad. It’s not over-burdened by long explanations. It’s just good, useful advice that all parents should review and periodically refer to while their son or daughter is abroad. We’ll be recommending it. A Parent Guide to Study Abroad is available from IIE Publications for $4.95. IIE is offering a significant discount for bulk copies for schools to give to parents (20 copies for $20.00). The companion book, A Student Guide to Study Abroad, can also be ordered for $14.95, with discounts of 30%-50% for bulk orders. Our summer programs in Europe and North America will take you on an exciting adventure! You will see some of the most beautiful places in the world, experience new cultures and gain knowledge to expand your horizons and prepare you for your upcoming college years.